Imagine you are walking down a city street. It is night, and the street is dark. The buildings around you are ancient, stained black with the soot of centuries. You see a light shining from a street-level window, piercing the darkness. As you come abreast of the window you see a Bible on a bookstand, open to a passage from the Gospels. A spotlight illuminates the print and its light spills out into the world. You stop and read. This is the image described to me by a priest I met recently. His church, St Mary Magdalen in Southwark, London, on a site that has been sacred ground since the 800’s, displays a Bible open to the Gospel of the week in a window looking onto a city street. He tells me that there is nearly always someone standing at the window, reading. The light that shines in the darkness is feeding hungry souls. On this first Sunday of Advent we pray, “give us grace to cast away the works of darkness and put on the armor of light.” In this darkest month of the year, we light a candle to remind us that the darkness will never overcome the light. It’s a candle of hope, because we are a people of hope. The prophet Jeremiah wrote at a time of turmoil and disaster for the people of God. They had been invaded and occupied by barbarians. Their leaders had been taken away into exile. They were hungry, afraid, and anxious about the future. The darkness seemed to be winning. But the prophet had confident words of hope to share. “The days are surely coming, says the Lord, when I will fulfill the promise I made ... Judah will be saved and Jerusalem will live in safety.” These are surprisingly cheerful prophecies, considering the source. In a dark time, the prophet recognized his responsibility to call the people of God out of despair, to remind them of the God who stands above and beyond all earthly powers, to encourage them to live into and up to the motto, “The Lord is our righteousness.” Justice and righteousness might not be evident in the land but they could rely on God’s promises to hold. The days are surely coming. Don’t despair. The light will shine again. One scholar writes that human beings despair when they cannot imagine God’s promised alternative future. God’s promised alternative future is laid out for us in Scripture, and it’s an especially vivid idea in Advent. We are entering a season of waiting and hoping. We have hope that God has an alternative future for us, a future of justice and righteousness, a future when there will be peace on earth, when all will be safe and fed and housed, when the abundance of the land will be shared and neighbor will watch over neighbor, the stranger will be welcomed and the vulnerable cared for. This is the hope of Advent, as we watch the light grow, week after week, and we see the feast of the Nativity drawing near. And we wait. We can look at our calendars and see that today is December 2nd, and know that in 22 days it will be Christmas Eve and we will be celebrating the birth of the holy child, the ultimate pledge of God’s faithfulness, God With Us; but we also know that we have celebrated over 2,000 Christmases and we are yet to see justice and righteousness prevail in our world. In this Advent season of 2018 there is darkness aplenty. The town of Paradise, California is in darkness this Advent, and thousands of people have lost everything they own. The migrants sleeping in a waterlogged stadium in Tijuana are trying to keep hope alive having arrived at the border only to be met by teargas and riot shields. The political soap opera in Washington DC becomes more conflicted and tumultuous every day. Children in Yemen are starving while we and our allies provide arms to those who are destroying the country. In South Sudan, five years into a vicious civil war, citizens are collectively holding their breath as a fragile ceasefire is extended. We search for a point of light in the darkness, a beacon of hope. And sometimes we find it: generous donors, compassionate local governments, peacemaking efforts. The prophets remind us of God’s imagined alternative future, and as people of faith we are called to live into that imagined future. We can use our imagination, fueled by the promises of Scripture, to live into the future Kingdom of God, even in the midst of darkness and suffering. That’s what the slaves did, when they sang of crowns and thrones under the whip of oppression. That’s what the prisoners in the concentration camps did, when they recreated Verdi’s Requiem from memory. That’s what the thousands of Central American migrants just the other side of the border are doing. They refuse to believe that the God who loves them wants for them to live in fear and oppression, unable to keep their children safe or feed their families. They are imagining an alternative future, one of freedom, of opportunity, of dignity. And we have infinitely more reason for hope than they. Yesterday I was in Fresno, representing the diocese and the North American Deans Conference at the installation of the new dean of St James’ Cathedral, Ryan Newman. 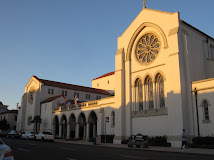 The cathedral is in the diocese of San Joaquin. 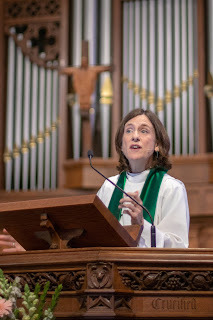 You may recall that San Joaquin was one of the dioceses most affected, indeed almost destroyed, by the Episcopal Church’s split a decade or so ago. The cathedral was claimed by those who had left the Episcopal Church and it took years for the Episcopal Diocese to reorganize and successfully bring a lawsuit to reclaim ownership. It’s been ten years since the people of St James have had a dean, and yesterday’s service was an important and joyful moment in their journey of healing. I commented to the diocesan chancellor that the exchange of the peace seemed to go on a very long time, and he responded that they had not been allowed to socialize under the breakaway regime. It brought tears to my eyes to see how very happy they were to be together and moving forward. They had held on to hope, they had waited and worked through dark and tumultuous times, and their long Advent season was at last being fulfilled. Today is the beginning of a new church year, and the first Sunday of the year of Luke. The first words we hear from Luke’s Gospel are the words of Jesus, describing times of darkness and distress, and encouraging us nevertheless to live in hope, to trust in God’s imagined alternative future, to free ourselves of anxiety and fear and instead to be attentive to the signs of redemption. Jesus calls us to let go of worry. That’s easier said than done for some of us, especially in a season when the culture all around us hypes up unrealistic expectations of perfection. But we can see the light shining in the darkness. The points of light may be subtle; we will have to be attentive to notice them: the food offered to a homeless person, the pet saved from a burned neighborhood, the delivery of blankets and clothing for migrants, the sharing of a home or a table. It’s almost like a secret code or password: when you see these things, you know that God is at work. In stressful, uncertain times we have a particular call: to uphold the promise of God’s kingdom, to keep hope alive, to imagine that alternative future, to demonstrate a different way of being for those who have a hard time seeing the light. Sometimes we are called to be a point of light ourselves. St. Paul’s Cathedral is literally a light in the darkness, as our Advent colors shine out, visible even to travelers arriving in San Diego by air. We are a literal beacon, and our community, rooted in love, is a spiritual beacon for all who feel the darkness weighing heavily on them. As we enter this season of hope and waiting, we are putting on the armor of light, wrapping ourselves around with the love of God. What might it look like to live as if justice and righteousness are already the rule rather than the exception? It might look like a congregation that engages in prayer for each other, that makes a commitment to celebrate together, that stands up for human and civil rights, that flings open its doors to those outside, that sings praise and gives thanks to God both for the promises already fulfilled and those still to be delivered, that shines a light in the darkness and waits with hope and joy for the coming of our God, Emanuel.